When you look for a new car, chances are you search for the most durable, safe, and long-lasting vehicle you can find. You look for top brand names that are the epitome of power and luxury. You look for long-term customer satisfaction. However, no matter how durable, safe, or long-lasting your new or used vehicle is, it is susceptible to problems. Problems with the transmission and the transfer case in particular are very common in certain models. These are issues that are not only costly, but also inconvenient, which is why it is important to be aware of their symptoms so that you can identify when the issue arises before it’s too late. One of the issues you should watch out for is problems with the transfer case. Inside your vehicle there is a component called the transfer case. This component is located inside of the drivetrain and it is responsible for providing power to the wheels. The power in your vehicle is originally generated by the transmission, and from the transmission it has to go to the axles that allow the wheels to turn. It is the job of the transfer case to bring that power to the axles. It is also the job of the transfer case to adjust the manner in which your tires are being turned while you are on the road. Your car won’t drive nearly as well as it once did if your transfer case starts to fail. If you notice your car’s performance drop significantly, it is important to get to a professional mechanic as soon as possible in order to find out what is causing it. What Causes Transfer Case Failure? There can be many causes for transfer case failure but the two most common include a shaft seal failure and high mileage. As you continue to use your vehicle you put more miles on it and as this happens it simply causes all of the components in your vehicle to wear out. This is a natural progression with vehicles but if you haven’t properly maintained your vehicle you will notice that the higher your mileage, the older your vehicle, the higher your risk for transfer case failure. Additionally the shaft seal which is located on your transfer case is designed to prevent hydraulic fluid from leaking. But if it starts to leak because of a shaft seal failure it will cause a great deal of problems with your transmission and your gear shift. What are the symptoms of transfer case failure? Transfer case failure is a potentially serious problem but it does have symptoms that you can notice early on. You might see hydraulic fluid leaking out from underneath your vehicle. You might notice problems shifting gears as you’re driving. If your car otherwise runs smoothly and you suddenly have shifting problems, and there is a grinding sound that accompanies these problems, that can be a dangerous sign. That grinding sound is typically related to a hydraulic fluid leak. The longer this problem goes, on the riskier it becomes for the health of your vehicle. In all of these cases, the symptoms are very easily noticed if you know what to look for. As soon as they start to manifest, you can bring your vehicle in for an inspection. If there is a problem with the transfer case, rest assured that our professionals can diagnose it and provide you with a solution immediately. This is not the type of repair you want to do on your own, especially if you have limited experience working on vehicles. 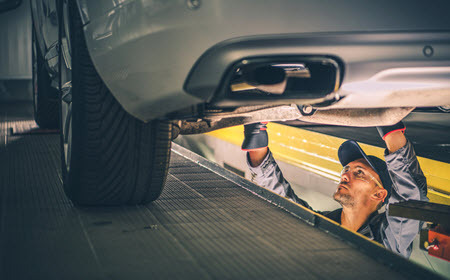 you are experiencing other issues with your vehicle, bring your car in to be inspected today and we can offer a fast, affordable solution to get you back on the road in no time. We have convenient locations and are happy to help. So call us at TechPlus Automotive. We are located conveniently to Phoenix, Paradise Valley, McCormick Ranch, and Scottsdale, AZ, and our service technicians are ready and waiting to help you. Call or stop by today to make an appointment.